So for our 12 day for The 12 Days of Christmas, we present Macrame Bracelets. When I was a kiddo, I learned how to do macrame but as with all skills one does not keep up on, I lost the ability to do it. Thank gosh for the Internet. 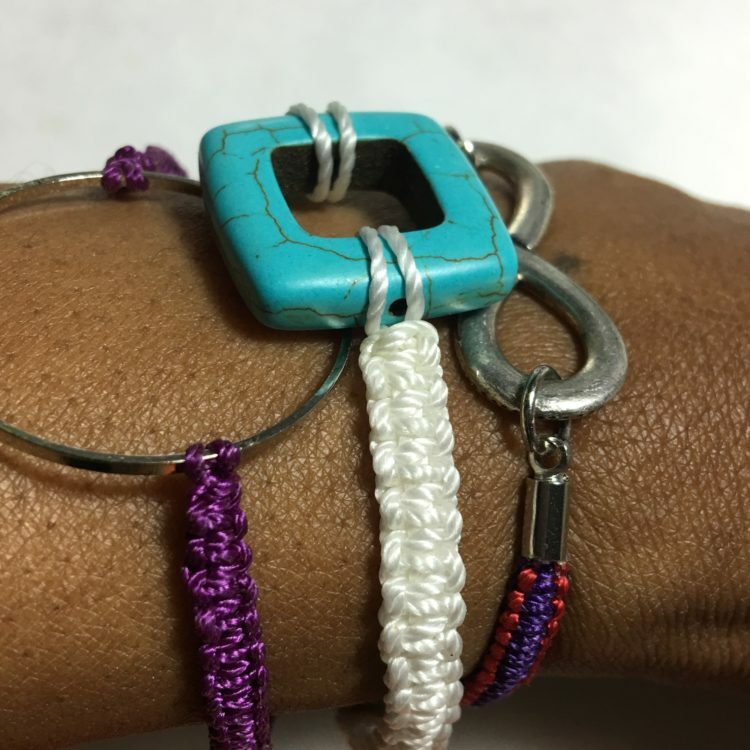 As I was looking for an activity to do with our jewelry design students, I came across a tutorial for a macrame bracelet and loved it. I had to relearn the technique and while it looks complicated, it is quite easy. What I like about it is if you use a finer cording, the bracelet looks delicate and elegant. 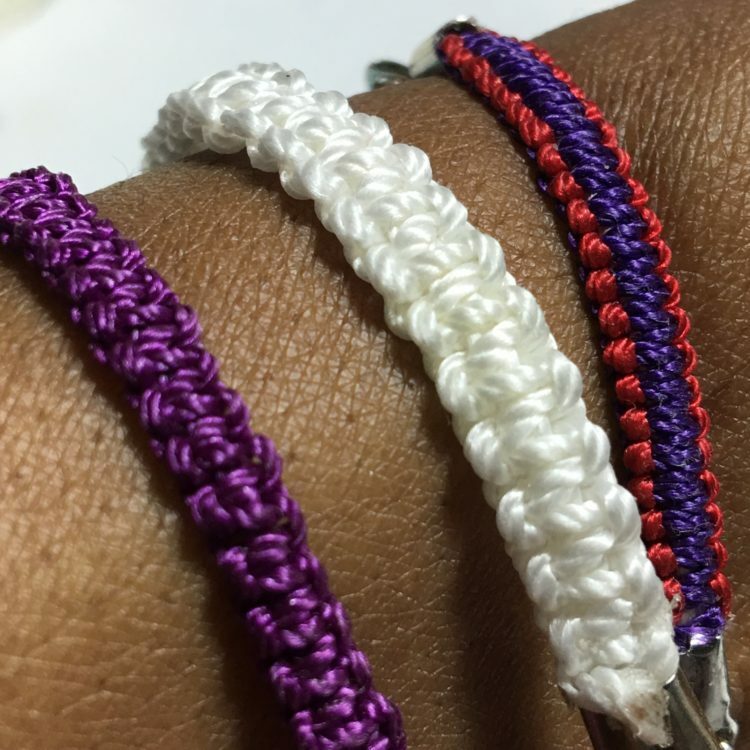 Use a thicker cording, and you have a more chunky and youthful bracelet. Be creative: use one color thread or two or three. 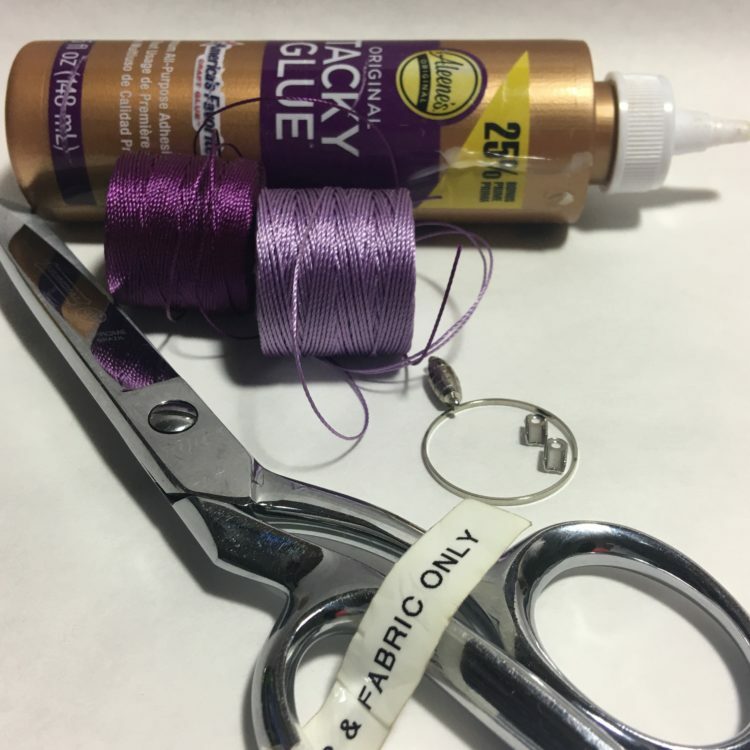 Pull the threads tightly for a more refine look, or leave them loose goose for a more fun tone. Check out the DIY below as well and a coupla finished samples. I decided to use colored yarn to help illustrate the technique. For the trial, start with 1 piece of yarn about 10 inches long. Cut two other colors 8 inches long. 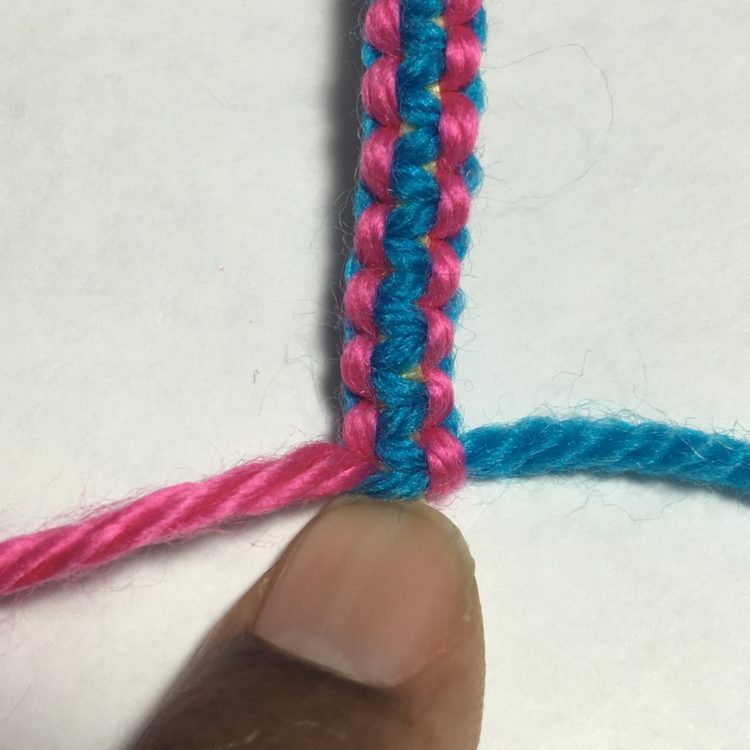 Fold the 10″ long yarn in half and tie a knot with the two other colors. 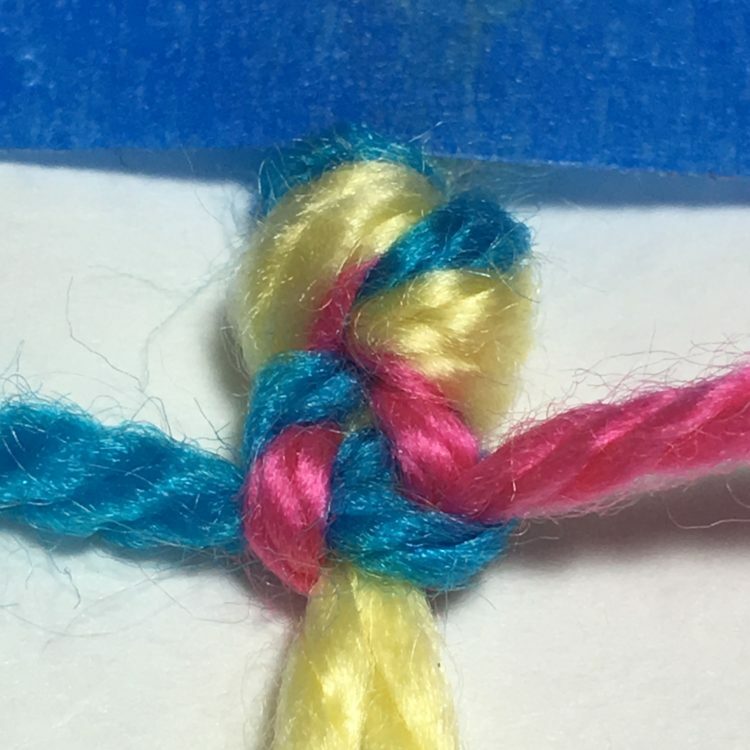 Tape the yarn down on your work station as shown above: the folded yarn in the middle and the two other colors on the outside. While you can start with any side, I started with the blue color, on the left hand side. 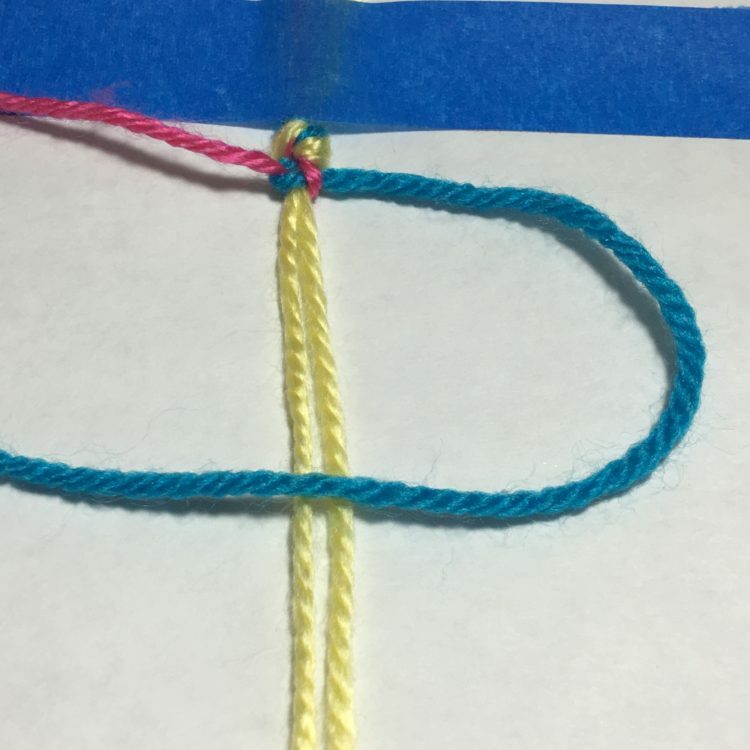 Create a loop and place the blue yarn over the double yellow yarn. Place the pink yarn over the blue yarn in a similar loop shape as the blue yarn. 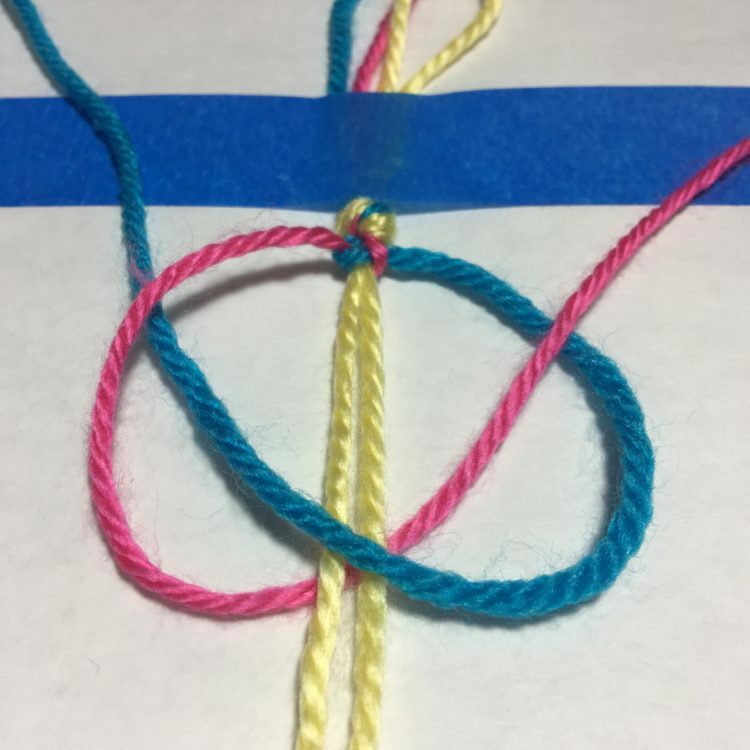 Then tuck the pink yarn beneath the two yellow yarns to come out within the blue loop and over the blue yarn as in the photo above. 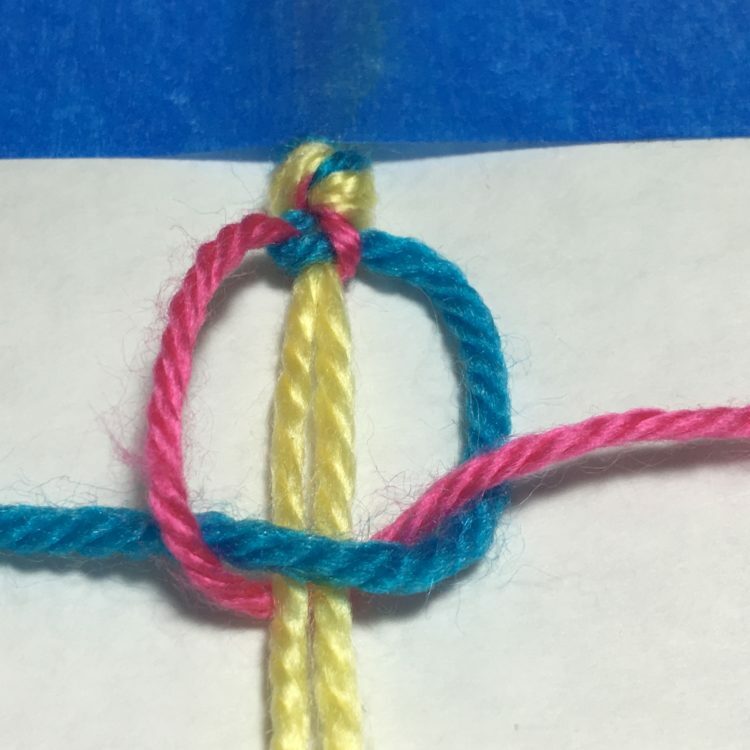 Pull the pink and blue yarns to create a knot. How tight you pull the knot is your choice. The tighter the knot, the less you will see of the middle yarn. But if seeing the middle yarn is part of the look of the final design, then a looser knot is ideal. Moving forward, this will be the way to determine which side you will be starting this. You will always start on the side that has the top loop. In the photo above, that is the pink loop. Create your loop using with the blue yarn, now starting on the right hand side. Make sure the blue yarn goes over the yellow yarn. Overlay the pink yarn over the blue yarn. 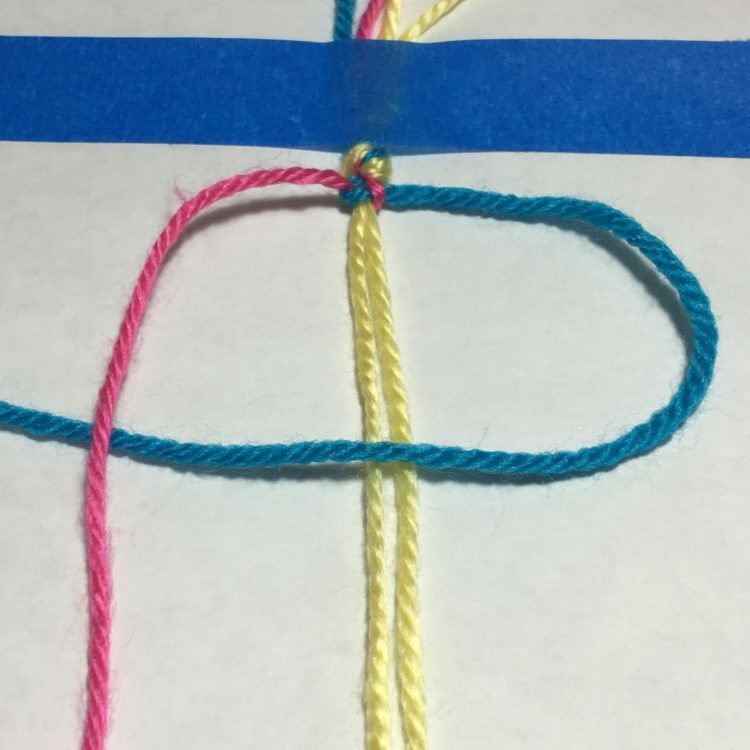 Pull the pink yarn under the blue and yellow and pull it through and over the blue loop. Pull the the knot tight. Because the pink top loop is now on the left hand side, that is the side you will now begin from. When working with three colors it is easy to see which side you will begin. 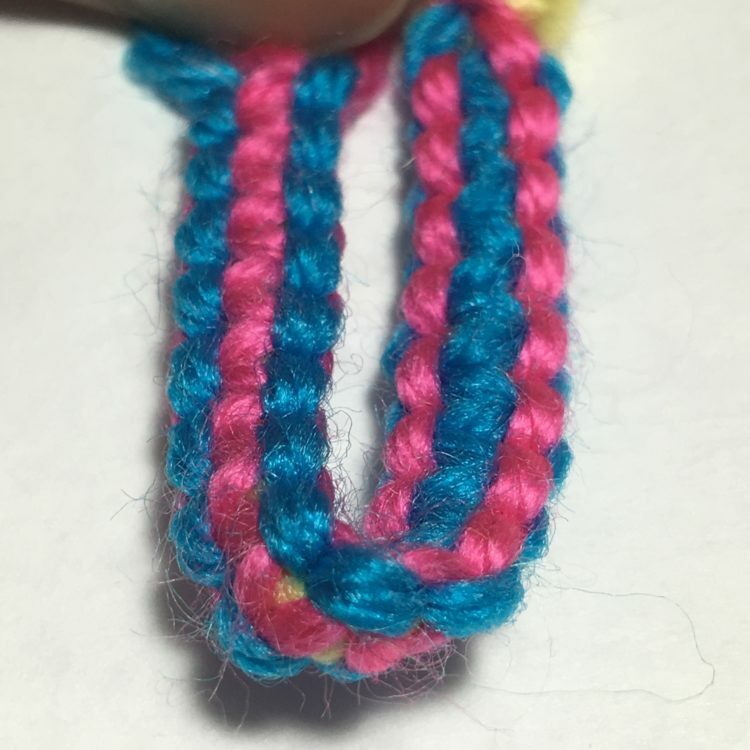 While it is easy to see when using 3 colors and larger sized yarn, it becomes important to understand the process when using a single color and much finer cording. And in our example here you will note, that you will always begin with the blue yarn. And the pink yarn will always be the top loop. All done. The beauty of using three colors is that you end up with two different color patterns. 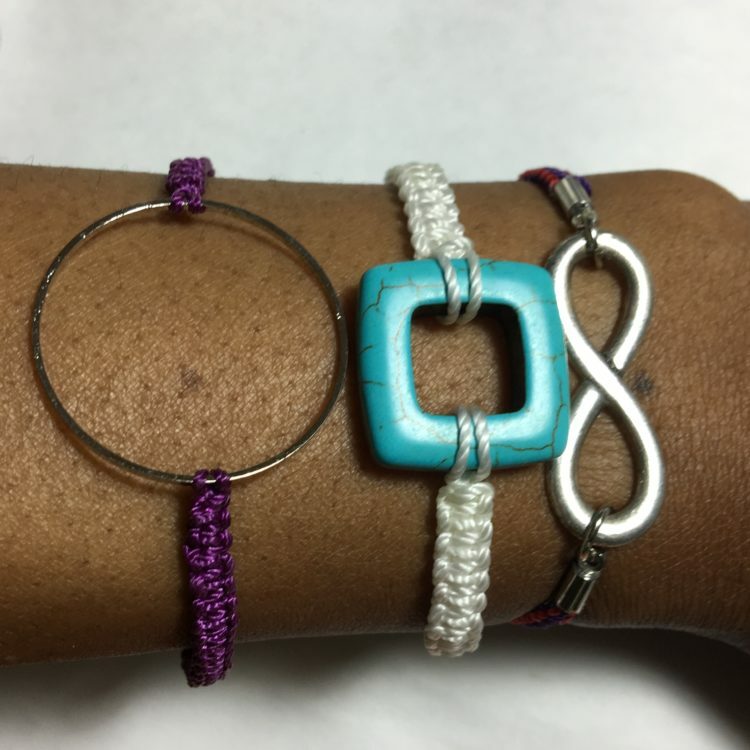 To make the following bracelets, the supplies needed are: macrame cording (you can use any size you want, the finer the cording the more delicate the bracelet and the thicker the cording the more chunky), magnetic closures, 1 set of cording ends, small ring or other basic shape findings, tacky glue, jump rings. Have fun with the finding you choose and the color of cording.